Place potatoes in strainer and press to remove excess liquid. Transfer to mixing bowl. Beat eggs lightly and stir into potatoes. Mix flour and salt together and add to potato-egg mixture; mix well and stir in minced onion and Irish whisky. Shape into 3-inch disks or patties. Heat skillet, grease, and sauté patties until bubbles appear on surface; turn over and brown flip side. Serve with Rum Applesauce and dairy sour cream. * Best made with “old” potatoes, held in refrigerator vegetable compartment 6-8 weeks. When in a hurry, use instant or frozen potato pancake mix, but add 1 tablespoon Irish whiskey to batter for perky, spirited flavor. Place apples and water in saucepan and bring to boil; reduce heat and simmer 10 minutes, stirring occasionally. Add sugar, all spice, ginger, and rum. Bring to boil and simmer additional 20 minutes, stirring frequently. Note: For quick Rum Applesauce, just flavor canned applesauce with dark rum, to taste, and 1 teaspoon ginger per 2 cups applesauce. Copyright © 1977 by Random House, Inc. All rights reserved. Printed in U.S.A.
Reblogged this on Make It For Me Now. 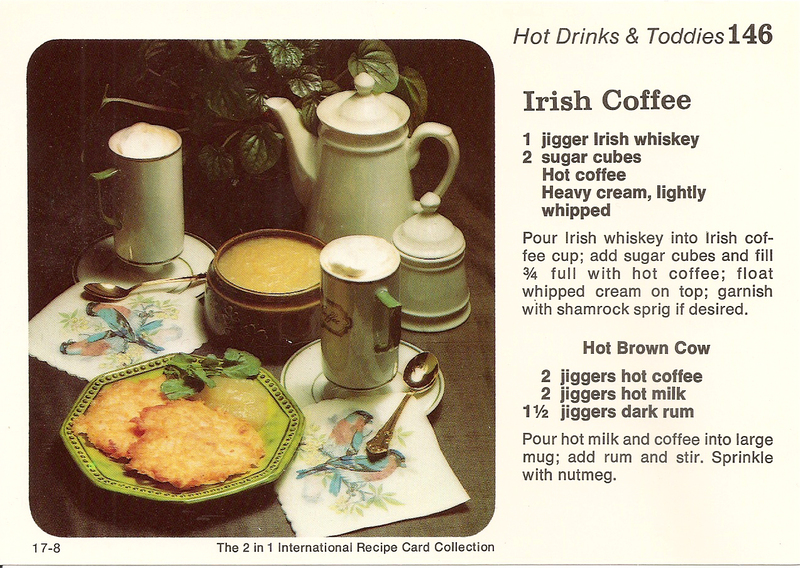 Love the idea of the Irish Whiskey in the potato pancakes.